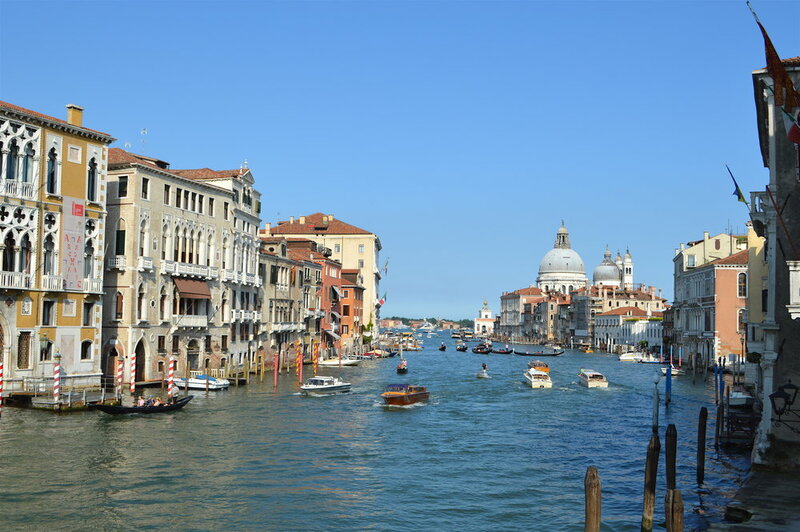 I began the journey in Venice with my producer mate Cammy and at the time we were there it was the Biennale art show with installations hidden throughout the town. 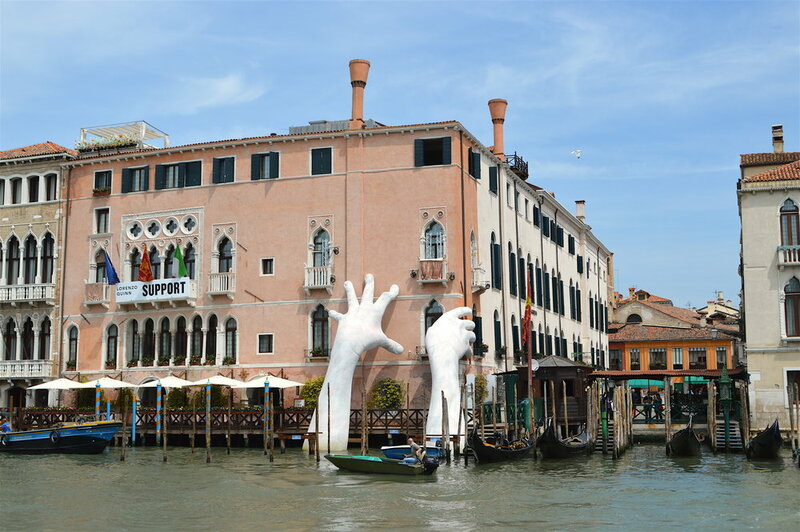 The first place we stayed even had a large statue of two giant hands emerging out of the water and grabbing the outside of the building. Venice was buzzing and the streets were full of sunshine. People were munching on freshly whipped gelato on every corner and the smell of ‘Bigoli in Salsa’, a rich anchovy onion spaghetti dish was wafting out from the steamy hot restaurant windows. We only touched the tip of the iceberg in terms of the food culture and I will definitely be back to dig deeper into the sea of black squid seafood pasta and tiramisu. When it was time to catch our train on a slightly muggy Saturday morning I almost didn’t want to leave this rustic, terracotta town but I knew that we were off to something special. At 9am a representative from the Belmond came to meet us at our hotel and we left in style on a beautiful Riva-like boat down the Grand Canale and were dropped off near the train station. The Venice-Simplon Orient Express is everything that you could imagine with its shiny navy blue exterior and gleaming gold engravings which would make the Hogwarts Express drool. We were greeted by the train’s lovely staff that included the head chef, barman and our personal porter, Paolo who was dressed to perfection in his crisp uniform and hat. Paolo showed us to our cabin that was covered in polished mahogany and not soon after sitting down we were offered a glass of prosecco. This classic cabin was filled with wonderful goodies and one thoughtful feature is that they provide you with postcards to send to family and friends and there is post box onboard. You are given a wash bag with all of the essentials and there is a cute cupboard with a hidden away sink to freshen up. You must remember to have a shower on the morning that you leave your hotel in Venice as it is worth noting that there is no shower onboard. They have kept everything exactly as it was in the 1920s and have just restored the carriages but not made huge alterations. We went for the later lunch at 2pm so that we could get settled in and start enjoying the scenery of the Swiss Alps. 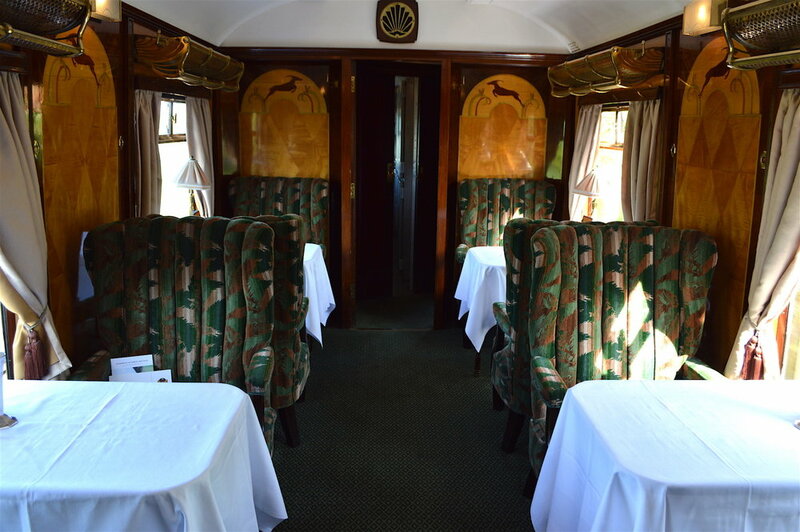 When we were seated in the lunch carriage it was like a scene out of Agatha Christie’s ‘Murder On The Orient Express’ which I was reading at the time. This was the first proper chance to see a few of the other guests and you could feel that there was an air of excitement and curiosity amongst everyone. Everything about this experience is lavish with huge attention to detail and our lunch was a silver service extravaganza of new season asparagus, John Dory, macaroons and hazelnut parfait. After lunch it was time to have a tour from the train’s manager of the exquisite interiors and hear the stories that have made this train so famous over the years. Each carriage has a story from where it was found and restored and if you look carefully everything from the upholstery on the chairs and patterns on the woodwork float from art decor to oriental styles. We were lucky to get into the kitchen and meet the chefs to see how they prepare such fancy food on a moving vehicle. The head chef Igor ran through the care and thought that goes into each dish and these pretty looking plates again compliment the traditional surroundings. We chose the later dinner seating which meant that we could dress up and have a drink or two in perhaps my favourite part of the train; the bar car! This evening really felt like we had gone back in time rushing through the misty hillsides in our cosy little carriage. I loved the carriage’s striking navy blue seating, jazz piano player and the stunning old fashioned bar which made it a magical place to sip on the Belmond’s new cocktail, “The Belmond Zest”. This was as you can imagine a citrus mix with Amalfi lemons, Campari and cherry sherry. I liked this part of the journey because it is when we got to meet a few of the other guests and hear their stories and reasons for embarking on this famous venture. Many had chosen it for an anniversary or birthday and some just loved travelling by train. When we finally made our way to the 9pm sitting, dinner was yet again a spectacular medley of sea bass with ratatouille, lamb cutlets and delicious red wine and we chowed this all down while we were coming up to the German border. After dinner we managed a last drink with some of our new friends and then off to our snug cabin that had been magically turned into bunk beds with chocolate on the pillows. Heavenly! The next day I remember being woken up by a little sunlight coming in from my window as the Orient Express was chugging away towards Paris. We quickly jumped out of bed in the hope of catching some photos of the seafood being brought onto the train for the well known lobster brunch. Head Chef Igor showed us how he classically prepared the lobster with a creamy herby sauce and we picked up a coffee in the Gare Du Nord. When we arrived back in our cabin Paolo had brought us some fruit salad and tea to keep us going until the brunch at 11am. As we were eating our Parisian lobby it was sad to think that this was our last meal on the Orient before having to get off at Calais. After saying our goodbyes to the wonderful staff and posting some postcards we headed onto a coach to travel through the Channel Tunnel. Even though we missed our little cabin when we arrived at the station in Folkestone we were greeted by a brass band serenading us while we boarded the charming British Pullman. I had definitely been spoilt enough but then a magnificent full English teatime arrived with sandwiches, cakes, champagne and tea. This is another traditional train from Belmond but it has its own special feel and look with every carriage holding a history. One particular car that caught my eye was created for Nelson Mandela on his visit to the UK and they covered the chairs in a vibrant springbok design. The train carried on all the way to Victoria and when it pulled in I felt wonderfully sleepy from the daytime champagne but also overwhelmed by such an experience. The whole journey lasts about a day and a half which sounds like it would be fleeting but in fact it is jam packed full of activity, breathtaking landscapes, incredible cuisine, unforgettable staff and stories that last a lifetime. While we were on the Venice-Simpson Orient Express I felt like everything slowed down a bit and I suppose this is because it really did feel like we went back in time, for this reason alone, this trip is priceless.